This is a slightly delayed post as I’ve been busy with the exciting developments that are currently taking place, including moving to my new home on the north coast of Scotland, getting married and semi-changing employers (I am still working for Alzheimer’s Disease International, but will now spend more time working with a local company in the north of Scotland called Dementia Friendly Communities). So, the following actually occurred the week of 5th August on the way from the flat in London to the house in Scotland. Never content to just do a journey with a single purpose, Bob and I decided we would take a couple of slight detours on the way up the road to visit a couple of lighthouses on the east coast of England that I had, for one reason or another, not yet managed to get to. We stayed over in Ipswich on the Sunday night after leaving the flat and went for dinner in the town. We had very mixed feelings about Ipswich as we went for an evening stroll through its streets. It very much seems like a place where the young have moved out and left behind a number of older communities. There are signs though that it is on the up and I hope it continues that way. We had a wonderful Brazilian dinner at Rios where we helped ourselves to salad and hot dishes, but also had a wooden block on our table that let the chef know whether or not we wanted more meat delivered (if the green half was facing up they would arrive with their meat on a hot poker and a massive carving knife, if the red half was up they’d leave you be). 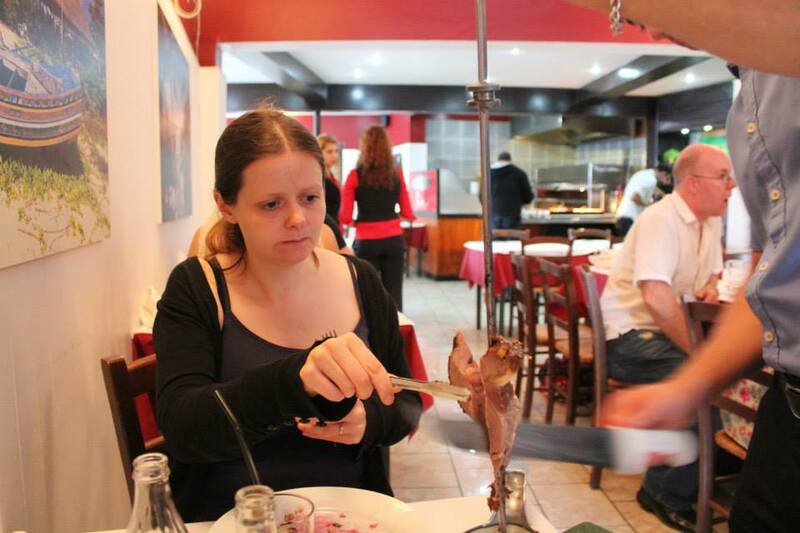 It was great food, but I think we were both “meated out” by the time we left as Bob in particular was keen to try each type of meat they had on offer. The following morning we set off for Aldeburgh where I’d read that a boat trip went around the nature reserve that encompassed Orford Ness. In a previous post I mentioned that a news story had been brought to my attention about the switching off of the light in Orfordness lighthouse as it was expected that the structure would fall into the sea within months. Having done some more research, I was then more reliably informed by the BBC website that it will, in fact, be another 7 or 8 years before it is swept away. We’d agreed that we would attempt to visit it after leaving London, but I then found out that the boat that goes across to the Ness from Orford doesn’t run on a Sunday or Monday. I thought that finding Aldeburgh River Trips was a temporary answer to this problem, but alas it was not to be as the boat travelled west along the river rather than south. 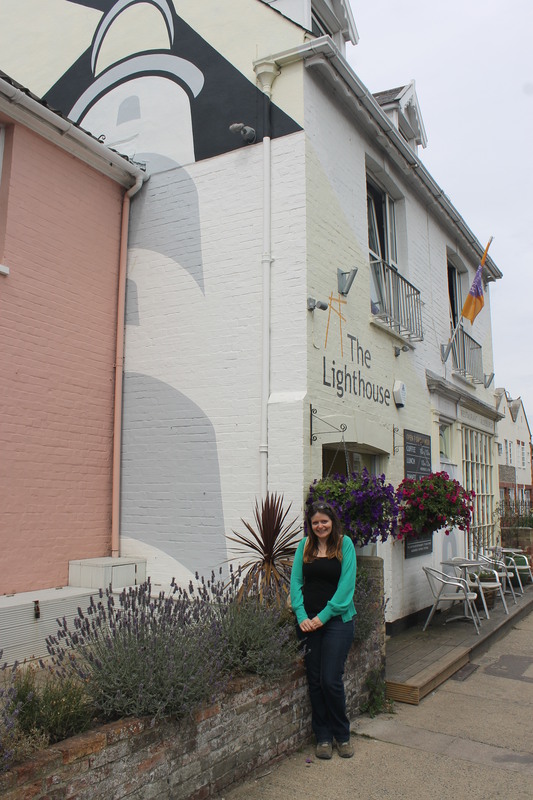 It was nice to get some fresh air anyway and we stopped off at The Lighthouse, a restaurant in (a rather posh ) Aldeburgh for fish and chips. We then drove around the Orford to get some long-distance pictures of the lighthouse. We will be back for this one (again) and certainly within the next 7 years! From Orford we drove back inland and then north towards our next stop in Whitby. During my tour I had struggled to find the high lighthouse on the cliffs here and I know that with Bob’s mapping software at hand we stood a much better chance. As we approached Whitby I did some online research on my phone to look for its location and discovered that, apparently, it is something of a tourist attraction! How this can be I don’t quite know as there are no signposts and the road you take to get to the lighthouse just looks like a narrow road leading to a farm! Another online instruction suggested to follow the light to get there – this is the most unhelpful direction if trying to access it by road. Nevertheless we found it I managed to get a quick “bag” in the cold wind before diving back into the car again. 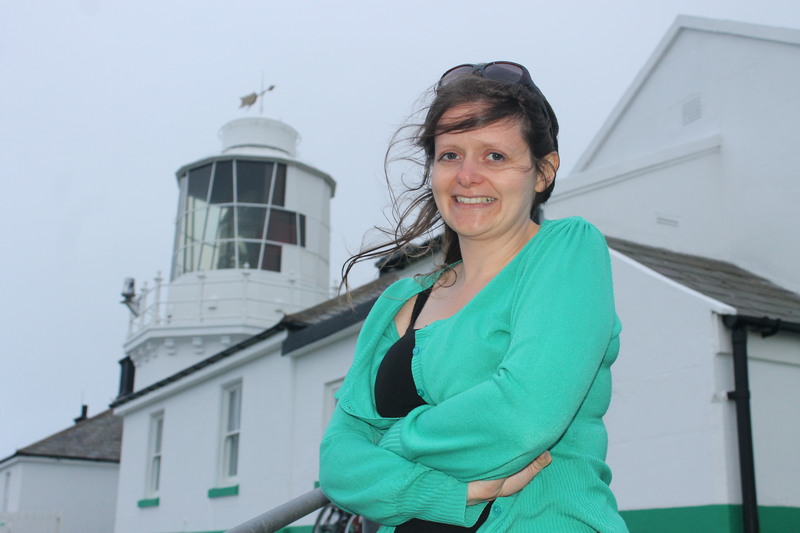 It’s a very Trinity House lighthouse and Bob pointed out that I was wearing a cardigan that matched the Trinity House green – anyone would think that was intentional! The lighthouse cottages are owned by Rural Retreats so it is possible to stay there, which would be fantastic at some point in the future, but we needed to get a move on before dark so our visit was fairly brief. The rest of our journey was, sadly, void of lighthouses as we needed to get back to the house by the most direct route (with a night’s stay in Glasgow as I was too tired to keep heading north through the night), Fortunately though, my destination was home where I am treated to a beautiful view of Dunnet Head lighthouse flashing at night and, a couple of nights ago, I could even see some of the lights on the islands around Orkney flashing. On our daily evening walks I can also spot Strathy Point lighthouse, although it is no longer in operation. I am now well-located for visiting some more remote lighthouses on the many islands that Scotland has to offer. More news of this tomorrow!